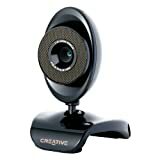 Get high-quality video and voice chat with the Creative Live! Cam Video IM Ultra. The high-definition 1.3 megapixel sensor and fast USB 2.0 connection ensure that you get smooth, vibrant video. The built-in noise cancellation microphone makes voice chat easy with crisp, clear sound and without the hassle of headset wires. Full featured software makes chatting more fun and safer for your kids. And installation is easy-the true Plug and Play install gets you up and running in popular IM programs like Windows Live Messenger, Skype, Yahoo! Messenger and AIM before you even install the CD.